One of the fiercest creatures known to have ever walked the earth is showcased on a new product from the Royal Canadian Mint with the debut of the 2016 $20 Tyrannosaurus Rex Silver Coin. The strike appears as the latest release in the Mint’s popular ‘Exchange $20 for $20’ program which features 99.99% pure silver coins sold at their legal tender face value of $20. "Bring home the king of the dinosaurs," promotes the Royal Canadian Mint’s website page dedicated to the Tyrannosaurus Rex Silver Coin. "Get your hands on this prehistoric beast that once could have roamed your backyard, running at speeds of up to 30 kilometres per hour!" 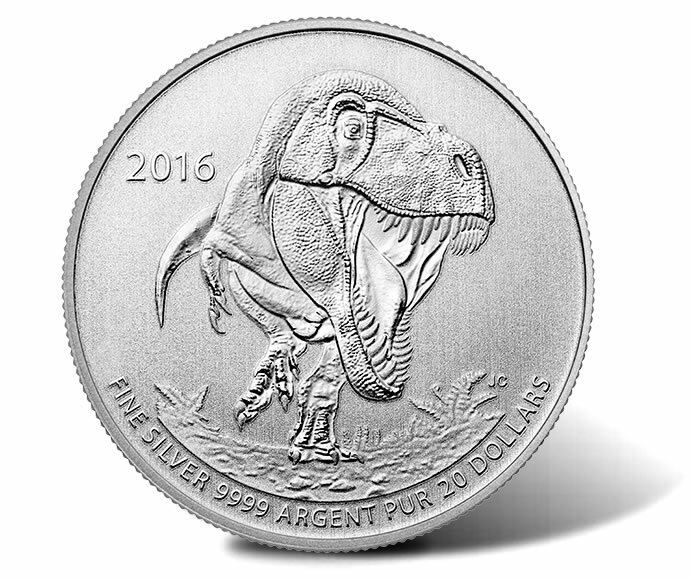 T-Rex coins are available individually or may be purchased as part of the $20 for $20 2016 Silver Coin Collection Subscription Program. Subscription enrollees will receive two additional $20 silver coins. They include the $20 Batman v Superman™ Coin in February and a third coin in May whose design is yet to be revealed. Buyers are charged for each coin as they ship. Previous $20 for $20 silver coins have proven extremely popular with collectors with a majority obtaining the status of sold out. Royal Canadian Mint artist Julius Csotonyi created the representation of the Tyrannosaurus Rex which appears on the reverse (tails side) of this silver coin. The depiction shows the dinosaur as if in motion, running forward. Inscribed underneath is FINE SILVER 9999 ARGENT PUR 20 DOLLARS. The year 2016 is found to the left of the T-Rex. These silver coins are struck as legal tender of Canada and bear the appropriate Susanna Blunt effigy of Queen Elizabeth II on the obverse (heads side). Inscribed around the portrait is ELIZABETH II, D G REGINA and CANADA. Orders for the T-Rex Silver Coin and the associated subscription program are available by visiting the Royal Canadian Mint’s website at www.mint.ca. You may also use this affiliate link to be taken directly to the RCM $20 for $20 page. Program coins are tax free with no shipping charge in the United States and Canada. I am wondering if it is too late to get 3 of the cartoon and one t-rex coins?